When you begin a new plan, it is private to you. You might keep a plan private if you're using it for eg. a reflective journal, or if you're just not ready to share it with others yet. Once you're ready to share a plan, click the Share button at the top right to see your sharing options. After you've selected your share settings, when you click 'Done', anyone you selected will receive an email with a link to the plan so they can start contributing or commenting. Anyone selected will be notified that a plan has been shared with them by email (though they can turn this off in their notification settings if they wish). Each person who you selected will also receive a notification when a comment is made in a planning cell that they started, edited or commented on. It's likely that you'll share most plans with all teachers in your service or room. Once a plan is shared, all teachers will then have the same level of access as the person who began it. They'll find any plans that have been shared under the service's or room's Planning tab. They'll be able to view, edit and comment on each plan. The author and any admins at your service will be able to change the share settings. 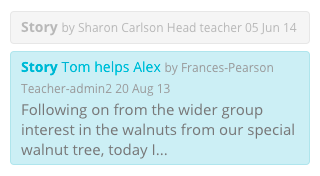 Select All teachers to share the plan with every member of staff at your service. 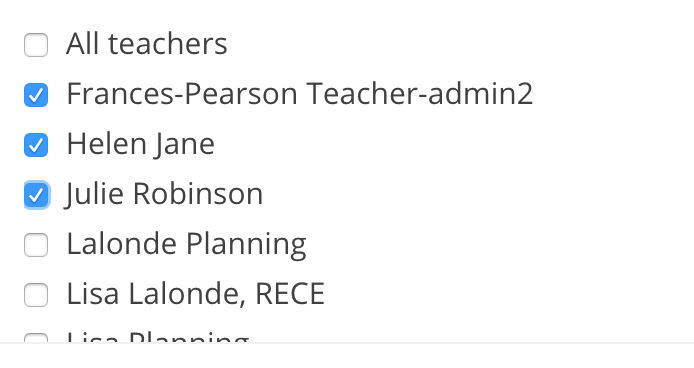 If you wish to privately share a plan with only the teachers in your room you should individually select their names. 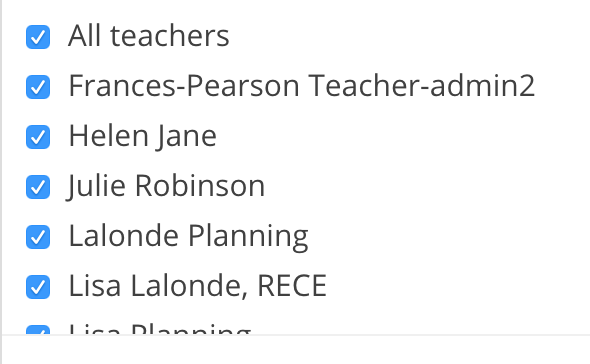 If you started your plan from within a room's planning area, your room teachers will be listed at the top. This means teachers who aren't attached to your room will not be notified and not be able to access the plan. If you wish to privately share a plan with one or more individual teachers, simply individually select their names. This could be useful for appraisals, professional development plans or anything you wish to share privately with your head teacher or mentor. Only those selected will be notified and have access to the plan. You can share any plan with the parents of the children you've added to the plan. (This means any family member who has been given admin rights – usually only the child's parents.) Parents can't edit plans, they can only view and make comments. If a plan has been shared with a parent, they will see it in a new Planning tab on their child's profile page. If you wish to share a plan with all parents of children in your service, start your plan from your main service planning area (rather than a room) and add all children to one or more cells. This would be useful for programmes and daily diaries etc. For room-specific planning, eg. room programmes, projects or events, start a plan from a room, select all children (you can only select children from that room) to add to one or more cells and then share with those children's parents. When planning for groups of children, you could add a few children in a cell, or one child per cell and then share with those children's parents. When you are planning for an individual child, eg. summative assessments or a transition report, you can start your plan from either the main planning area or the room that child is in (depending on where you want that plan to live), add only that child to a cell and share with that child's parents. Who can see linked stories, plans and notes in a plan? In any planning cell, it's possible to link to stories, notes and other plans. Learn more here. 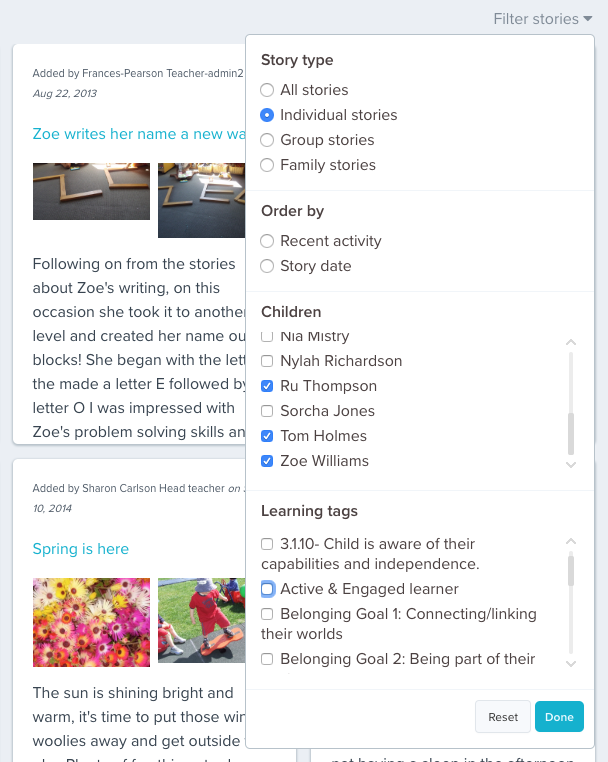 When you share a plan with teachers and/or parents, each linked story or child note is accessible to all teachers, but only accessible to the parents of the children that are included in them. Linked plans are accessible to anyone that the linked plan was originally shared with. What can parents access in a plan? If for example, you start a plan which you share with all parents at your service, and in one of the cells you link to a story (or child note) about an individual or a small group of children, only the parents of the children tagged in the story or note will be able to access those links. All other parents will simply see a greyed-out link that they cannot open. What can teachers access in a plan? 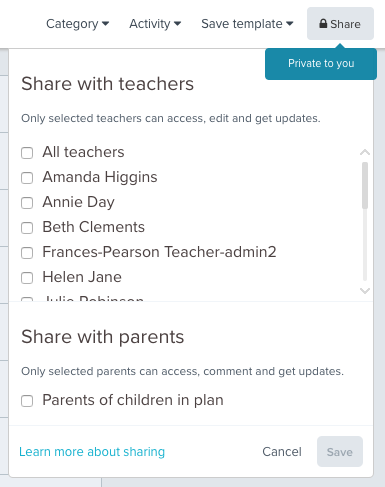 If for example, you start a plan which you share with teachers at your service, and in one of the cells you link to a plan which is private only to you, only you will be able to access those links. All other teachers will simply see a greyed-out link that they cannot open. Please think carefully about the content you include in a plan if you're sharing it with parents of more than one child. Think about what each child's parents would be happy for the other parents to read and see.